The scientific name Diuris of the plant called Donkey Orchid is derived from Greek prefixes Di meaning two and ouris meaning tail. One understands this nomenclature when he sees the two lateral hanging petals. These petals look like two hanging ears of a donkey. When the petals swing in air, they literally resemble a donkey squealing and moving his head. 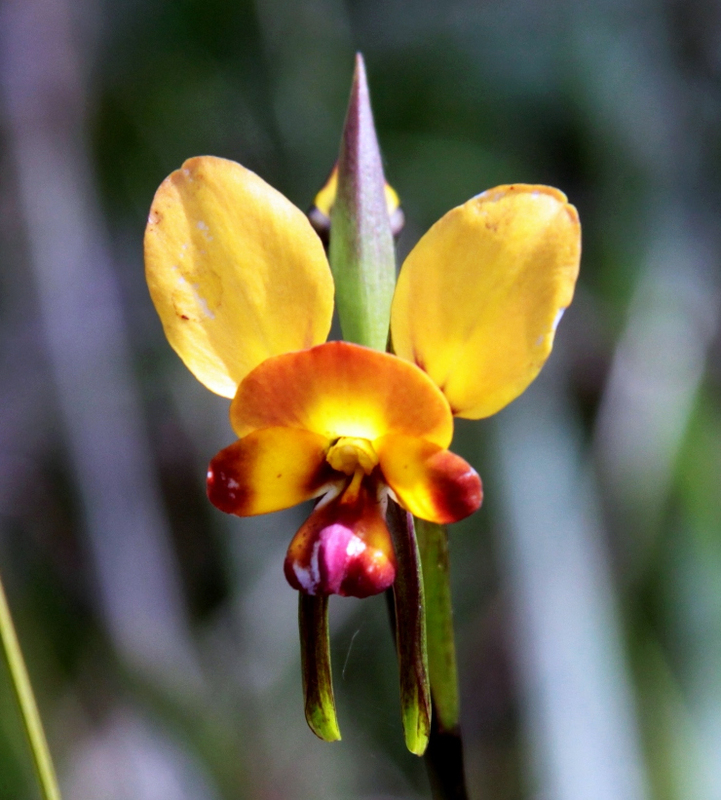 There are dozens of species of orchids under the genus Diuris. They are terrestrial meaning they grow on ground and they are perennial in nature. These plants have a network of roots and 1-2 tubers. They grow in places with well drained soils and wet winters. The most common regions where one finds donkey orchid in Australia are the grasslands, woodlands, and rocky outcrops. Donkey orchids have bright colored flowers that attract bees and other pollinating insects even though their flowers do not have nectar and very few of the flowers in this genus have any scent. Scientists say that bees and flies are deceived into pollinating as they think that these flowers have food for them. They come and do their job of pollinating but get no reward as there is no nectar for them in the flower of donkey orchid. The leaves of donkey orchid are grass like. If the upper petals of the flower are like the ears of a donkey, it also has two greenish sepals that are lateral and drooping. There are only 1-2 leaves that can be up to 20cm long and 5mm wide. There are many perennial species of orchids that pop up from tubers lying underground. It is difficult to tell the difference when the grass like leaves grow very close to the ground. It is only when the distinct shape of the donkey ears is seen in the flowers that one can recognize the donkey orchid plant. These flowers (3-5) grow along a single stem or a stalk that has a wiry appearance. Donkey orchid remains dormant during summer season and it becomes active after soaking rains during late autumn season. In fact, many people who sow the seeds become worried when they find the seeds not germinating even after waiting for several weeks. This happens because this plant loves to live in a symbiotic relationship with a soil fungus and germinates only when this fungus is present in the soil. After germinating, the orchid requires this fungus for its nutrition. It is also required by donkey orchid after coming back into action after dormancy during the summer season. Once the plant grows its grass like leaves, it comes out of its dependency upon the fungus as photosynthesis of leaves starts to take care of the nutrition needs of the donkey orchid.